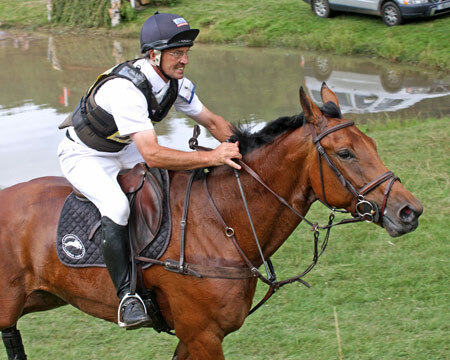 Joe Meyer posted the best result of the Kiwis with second on Sanskrit in the British Open Championships at the weekend's Gatcombe horse trials. 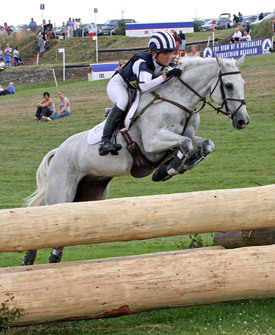 Daisy Berkeley and Spring Along won Gacombe's British Open Championship at the weekend. Several other New Zealand riders also posted good results at Gatcombe, including Dan Jocelyn and Special Advocate, who won the advanced class earlier in the weekend. Yesterday's Open Championship was won by Gloucestershire-based Olympic rider Daisy Berkeley, riding the evergreen Spring Along. Spring Along lived up to his name, jumping like the proverbial stag over the 25 fences around Captain Mark Phillips' cross-country course. Meyer and Sanskrit were second with a fast clear inside the time, a result which surprised the British based Kiwi. "When I saw that Caroline Powell and Gemma Tattersall had made the time I thought this is getting serious," Meyer said. Gemma Tattersall, the mare Kings Gem, was third. After the dressage and show jumping, Berkeley and Spring Along headed the class. On the cross-country, Spring Along belied his 17 years and looked like a horse on a mission. Wasting no time in the air over the jumps he and Berkeley maintained their fast pace, coming home just two seconds over the optimum time. This added only 0.8 time penalties to their dressage score, meaning they took the class with a comfortable 2.5 penalty margin. "I wouldn"t ride many that fast round a course like Gatcombe but after 12 years together I know him so well," said Berkeley, who later announced that she is expecting a baby at the end of January. She is therefore no longer be competing at Burghley and has withdrawn as reserves from the British squad for the forthcoming World Equestrian Games. 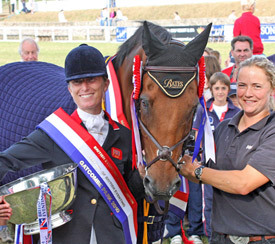 "To win the British Championship with Pod means loads to me as he has made my career in eventing. He so deserves to have his name added to the roll of honour." 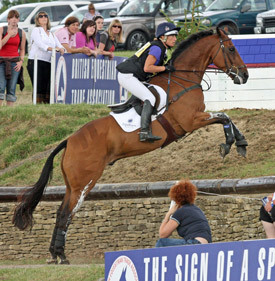 After this win Spring Along now holds the record for the horse with the highest number of points in British Eventing. Gemma Tattersall and Kings Gem were almost at the bottom of the class after the dressage, but a double clear with just 0.4 of a time penalty meant that they moved up 29 places to third place. "She is a mare that loves life," said Tattersall, the reigning Under 25 National Champion. "In the warm up I had no control but once in the show jumping she was amazing and gave every fence a foot. I never thought I would ever be brave enough to be get close to the time here but Gem and I were completely together today," she said. Joe Meyer and Sanskrit were the best-placed Kiwis in the British Open Championship, finishing second. 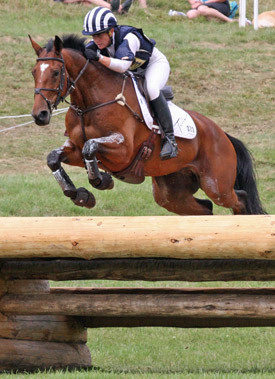 Caroline Powell and Lenamore were fifth in the open championship, and Powell was third on Thornfield Jones (below) in the intermediate championship. The breeder of Kings Gem, Mary King, finished in fourth place with Apache Sauce. King had led the dressage with Imperial Cavalier but dropped out of contention with two show jumps down. Kelso based New Zealander Caroline Powell took fifth place with the feisty grey Lenamore, another who clocked in inside the time. 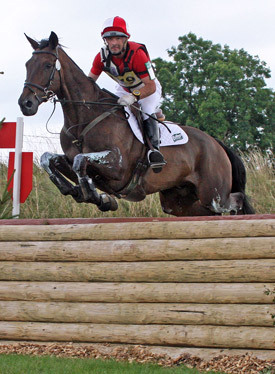 Fellow Kiwi Andrew Nicholson was sixth with Parkmore Repecharge, and was also 10th with Armada. Powell's Boston Two Tip was 14th. Oliver Townend, who was leading after the dressage and show jumping with Ashdale Cruise Master, withdrew the grey before cross country and subsequently added 20 penalties to his score with the well placed Imperial Master to finish in 16th place. • Ruth Edge and Applejack II capitalised on their high scoring dressage test and made up for the four faults accrued in the show jumping with a fast clear to win the Intermediate championship. "I thought the pole in the show jumping was going to cost me and I was going to be cross with myself but he was fantastic cross-country," Edge said. "He doesn"t have a lot of thoroughbred in him but makes up for it by being so easy to ride," Edge said. Applejack II, an eight year old by show jumping sire Calvados, is now being aimed for the National Eight and Nine Year Old Championship at Blenheim in September. 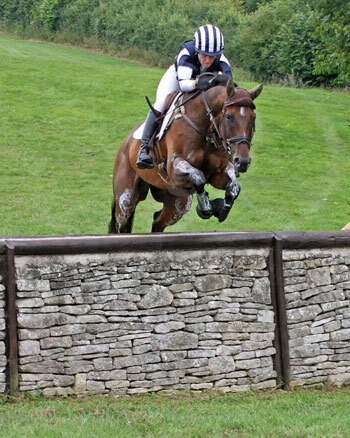 The pair also won the Barbury Castle two star event recently. Several combinations had the opportunity to grasp the championship title but failed to do so. The opportunity for William Fox Pitt and Gaucho to take the lead ended with a runout at fence 19 while Matt Ryan and Bonza Kingscanyon retired after a run out at the second element of fence seven. They were one of several combinations to be caught out there. With each phase proving influential, the outcome was never a foregone conclusion. Twenty of the 69 finishers rode clear rounds in the show jumping arena and time faults round the track designed by Jon Doney also proved significant in this phase. But as always, around the Gatcombe cross-country course a fast time was necessary for those wanting to stay in the frame. Caroline Powell and Thornfield Jones made their long journey south worthwhile with the fastest clear of the day. Added to their clear round show jumping this meant they jumped up from 25th after dressage to third place overall. Likewise Paul Sims and Power of Dreams put in a fast clear to move up to the runner up position just 0.5 penalties behind the leaders. The result was literally a dream for Sims, who only six weeks ago got back in the saddle after five months off due to a blood clot in his chest. 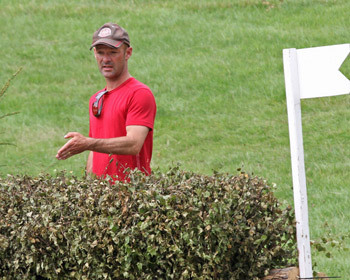 "The team at the yard and his owner Kim Belton have done a fantastic job in getting the horse prepared," he said. "I knew he had a chance of doing well. He has always been a good jumper and today the further we went the faster he got. He was just Mega." The nine-year old, who is by the show jumping sire Heartbreaker, is another who will be heading to Blenheim. 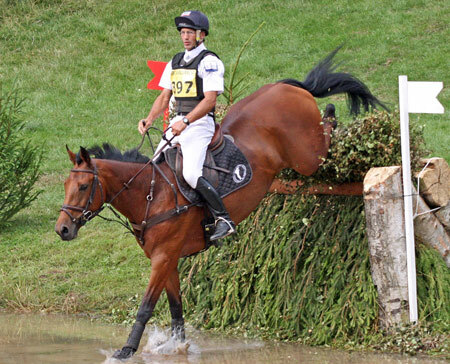 New Zealander Andrew Nicholson finished sixth on Qwanza. • The intermediate section was marred by the death of chestnut mare Roxanna VI, who fractured a hind cannon bone in a fall at fence 17, the trakehner. Roxanna was ridden by France's Arthur Duffort, who is based with Andrew Nicholson. The seven-year-old mare, owned by Julia Hardy of London, had an intermediate win at Tweseldown earlier this year and was second at Aldon and in the CIC** at Somerley Park. Qwanza puts on the pace for Andrew Nicholson in the intermediate class. They finished sixth. 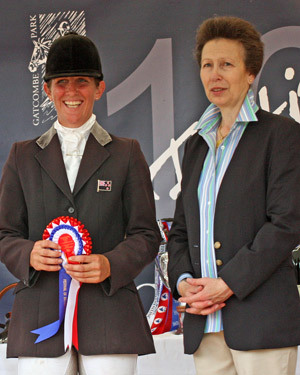 Caroline Powell receives her fifth prize from the Princess Royal. Joe Meyer sorts out a line on the cross-country. Caroline Powell and Boston Two Tip, 14th in the open championship. 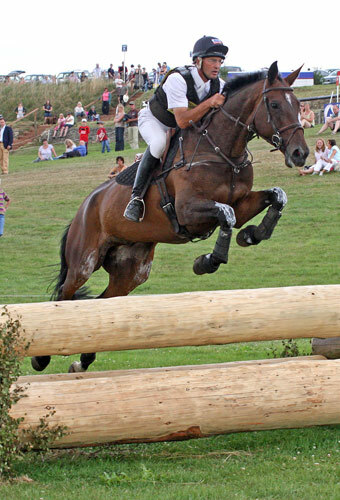 Andrew Nicholson and Parkmore Repecharge were 6th in the open championship.